Redditch, UK-based Hycontrol has been providing level measurement solutions to the coal and quarrying industries for over 30 years. With a comprehensive range of technologies available and extensive industry experience, Hycontrol works closely with its customers to ensure a precisely-tailored solution for their particular application. underground. The coal is carried up a lift and stocked in two 18m buffer silos. From there the coal is conveyed into one of 36 20m storage silos. Previously the level in these silos had been monitored using aging Pulse Radars Systems (PRS) with large parabolic antennas and aiming kits. The PRS provided only a weak return signal caused by the pulse reflecting in a dusty environment. Under these circumstances, it was difficult to obtain accurate and reliable level data. A trial of Hycontrol’s VG6 FMCW (Frequency Modulated Continuous Wave) radar device equipped with polypropylene drop-shaped antenna was undertaken. The VG6 FMCW radar uses a high frequency (26GHz) signal which increases during the measurement. The emitted signal is reflected back from the product surface and received after a time delay. Further signal processing of the difference between transmit and receive frequencies is carried out and the difference is directly proportional to the level. The VG6 FMCW radar has two unique features: firstly, it has unique patented design ‘drop’ shape antenna. This new antenna shape makes it difficult for product to build up on the antenna front face and still continues to work even when heavily coated with product. The VG6 is especially suited for long range, dusty solids applications such as powdered cement and coal. It was clear during the trial that these FMCW devices did not suffer from the same problems as the PRS due to the power of the radar transmission and the drop-shaped antenna’s resistance to product coating. No aiming kits or large apertures were required. The old PRS have now all been replaced with VG6 radar systems. Hycontrol’s offerings to the coal and mining industry extend far beyond just level measurement, though. The company has won multiple industry awards for its pioneering Silo Protection System (SPS), a comprehensive contents and pressure monitoring system for powder silos. Pneumatic conveying of powders uses pressurized air to carry the product from its transport to the storage vessel. This raises significant dangers if the silotop filter cannot vent the air (for example if it has become blinded with dust) and over-pressurization can rupture the silo or blow the filter element clean off the roof. This obviously has severe Health & Safety implications. Hycontrol’s SPS is the only system on the market that currently meets and exceeds Mineral Product Association (MPA) guidelines for the safe storage of powdered product. The system fully tests all essential safety components (pressure relief valve, pressure sensor and level probes) at the push of a button before each and every fill, and will only allow filling to commence when the checks have been passed. The system has been successfully installed across a wide range of industries, not least in the mining and quarries. Hycontrol’s range of Microwave switches have also proved useful in many coal/quarry applications, often for blocked chute detection on crushers. Hycontrol’s new generation of microwave switches is proving to be an extremely reliable, robust and cost effective replacement for ageing nucleonic systems, offering operators a 100% safe solution. They provide a simple non-contact, non-intrusive option suitable for many applications on both liquids and solids. 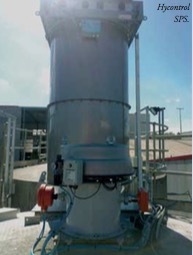 A typical installation consists of a microwave transmitter and receiver, mounted facing one another across the bottom of the hopper. During operation the transmitter emits a continuous, low power, 24GHz microwave beam to the receiver and an output relay is energized or de- energized when this beam is obstructed by the material being monitored. The switch trigger point is determined by the amount of microwave energy received and can therefore be adjusted to cater for specific products and applications. A key advantage of this latest generation microwave technology is its ability to ‘see through’ low dielectric materials. This means that low-cost replaceable windows can easily be fitted into the sides of a chute, keeping the process closed with no disruption to material flow and the microwave transmitters/receivers safe from the harsh environment. The system is extremely easy to set up and calibrate and the microwave signals are unaffected by high dust levels or material build up on the sides of the chute.